Yesterday, I talked about the full-script format. Today, let's look at the other main method. Plot Style. When writing in plot style, you don't include panel breakdowns. Instead, you simply provide an overall description for the page, setting the scene in a more general sense. This method really does boil down to being a letter to the artist. Sometimes, it's almost a prose style, a few sentences or a paragraph or two effectively "telling the story" of the scene. Some people who use this method only describe the scene and wait until the art is finished before writing the dialogue, but I actually include the dialogue in the original script. For me, it helps with my storytelling and pacing, and let's me make sure that the artist is aware of any vital moments on the page - be it action, an expression, or a line of dialogue. Back to the desert battle. Thus commences a verbal standoff. 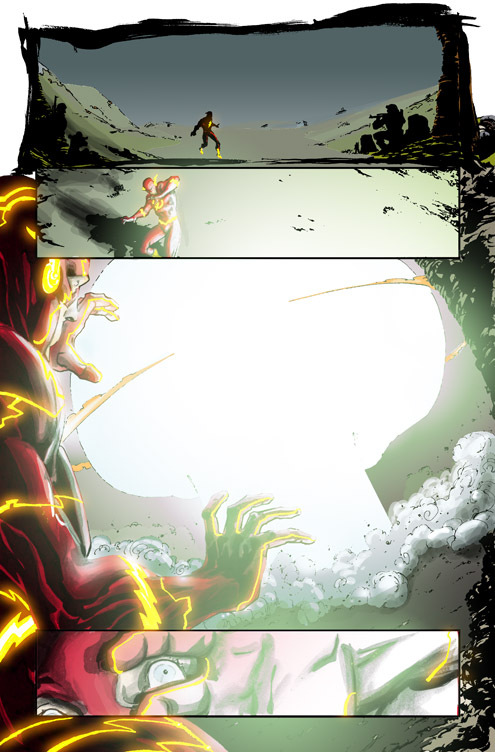 The FLASH is not thrilled about seeing CAPTAIN ATOM. They are still in super speed mode as they talk. If you can, let's try to show the briefest of movement of the SOLDIERS in battle. 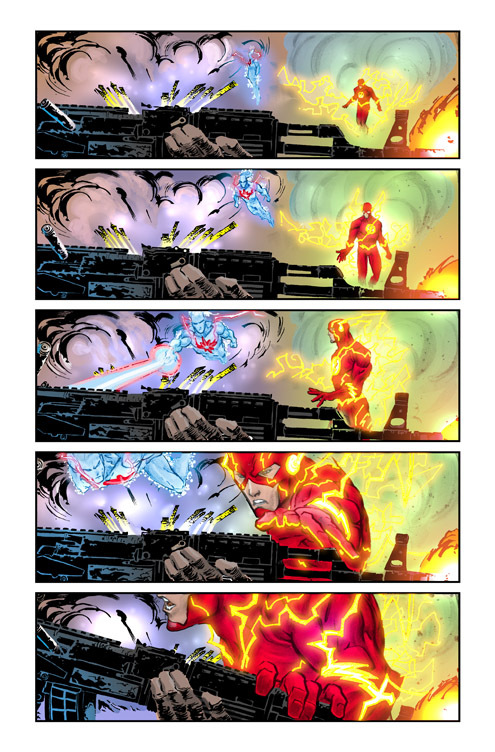 CAPTAIN ATOM and FLASH are moving at great speeds indeed, but time isn't stopping, only slowing down considerably. They seem to be interacting with the world almost stopped around them. Maybe we use a machine gun as the point of reference, seeing the chamber click open and kick out the shell casing, followed by the actual bullet slowly emerging from the end of the barrel. We'll see this is successive panels either with our heroes as they talk, or off to the side…like a counter of imagery. I think a visual cue will add to the effect. While not outright attacking him, the FLASH is uneasy about CAPTAIN ATOM. CAPTAIN ATOM tries to diffuse the situation, with limited success. Captain Atom: Where exactly should I be? Flash: On lockdown or something. Safely tucked away. Captain Atom: Am I a threat? Flash: Ask New York. What was that volcano all about? Captain Atom: I didn't cause the volcano. I went to stop it. Flash: You sure about that? The way the League talks, they're not so sure. You're unstable. Captain Atom: Interesting choice of words coming from somebody whose molecules are vibrating at the speed of sound. Who are you? Flash: They call me the Flash. Flash: Stumbled upon this little dispute and thought I'd take the toys away from the kids. Captain Atom: Contrary to popular opinion. I'm no threat. I came here to help as well. Flash: I'd feel a lot better if you had a Geiger counter around your neck. No offense. Captain Atom: I'm not leaking radiation. If I was, I'd go into containment voluntarily. I'm no stranger to laboratories. BOOM! The nuclear warhead begins to explode. It's the first few seconds of the explosion. Brilliant, blinding light. Then, just starting to drift into the sky - a mushroom cloud in the making. (Check out this video: http://www.maniacworld.com/Tsar-Nuclear-Explosion.html ) . Reactions by the FLASH, his face illuminated by the brilliance of the blast. Captain Atom (caption): In that microsecond, the situation goes supercritical. Captain Atom (caption): I'm too late. Flash: What did he do? Pretty awesome stuff, huh? I absolutely love this issue of Captain Atom. Freddie's art has never been better, and the way Jose Villarrubia uses the colors to play the heroes off one another is great - the vibrant blues and purples of Captain Atom and the bright and bold reds and yellows of the Flash. Brilliant. You'll notice that I even included references for the nuclear explosion. Never underestimate the power of references or visual aids. Whether it's an image, a scene from a movie, or whatnot - if it will help you convey the effect of the scene to the artist, go for it. Now, that's not to say that you should do this for every page or every panel, but if you are doing the research for something already, don't make your artist waste time hunting online. Give them all the tools they'll need. Part of what makes the plot style work for Captain Atom is my close working relationship with Freddie. We regularly discuss the book, the story, and the scope and theme of the book. In fact, for issue #1, we essentially talked through the entire issue page by page, and then I went and simply typed up what we said as if it was a transcript of sorts. I very much prefer the full script method overall, and I wouldn't hesitate to use it on Captain Atom if I felt the need to, but so far it's been working well on that particular project. At the end of the day, making comics is an extremely collaborative experience, working with a host of people (artists, colorists, letterers, editors, etc.) so communication is key. Your script is the foundation of that communication. Be clear. Be concise. And, avoid typos - they just get in the wry. You have experience and schooling in film and television, right? In writing? Would you recommend this form of "loose" script writing for TV or film? Nope. TV and film scripts each have a specific structure and format. J.T. Krul is a writer, currently working on Captain Atom for DC Comics and Soulfire at Aspen Studios. He has written for such titles as Teen Titans, Green Arrow, Fathom, and recently finished the first volume of his creator project MINDFIELD. How to Break Into Comics? An Answer. Captain Atom #5 - Out This Week! Soulfire #6 and Amazing Arizona Con!